Feeding: The Morkie should have up to 3 smaller meals per day. 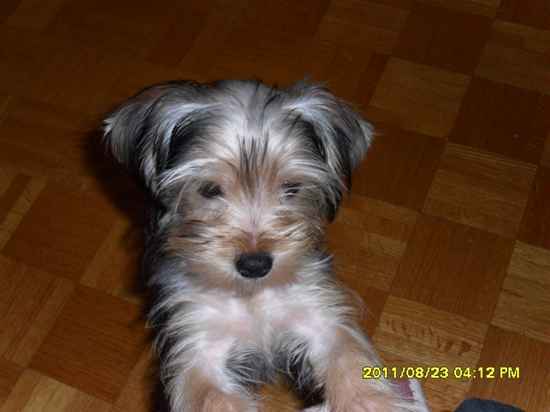 Family Dog: The Morkie is great with kids as well as our other large dogs. Training: The Morkie is fairly easy to train compared to our other breeds. Behavior: The Morkie has a wonderful temperment. They love to play but are also wonderful lap dogs that love to cuddle all day. Barking: The Morkie barks very little. Exercise: The Morkie loves to play outside to get their exercise. Appearance: The Morkie is typically white with cream colored ears. Companionship: The Morkie makes a wonderful companion dog. Coat: The coat of the Morkie is very soft. History: This hybrid was born from a mix of Maltese and Yorkshire Terrier. We can find two distinct origins, the first one coming from the United States and the second one from Canada, more precisely in Quebec. The first Morkie appeared in 1990's and had characteristics such as hanging or down ears, the silky and straight coat, colors from black and tan to tricolor. It is impossible to find the creators of this designer dog because the only interest is to obtain the F1 type popularized in the same wave as the "doodles" by Americans. The mix remained popular because it's non shedding coat, small size and interesting "look". On the other hand, the temperament differs, individually, ranging from calm and soft to active and nervous, all, however, with a remarkable intelligence. The second comes from (fire) Mrs. Gaétane Blanchette of St-Lin, impassioned breeder, who named it "Linois". Linois is small size dog that has a long, silky coat of solid blond to champagne with straight ears and short tail like the Yorkshire Terrier. This type has more of the Yorkshire temperament and is both active and playful with a remarkable intelligence.